NJBIA has received a “Champion of Inclusion” award from the nonprofit Advancing Opportunities, a leader in the field of disability services. From left are Jack Mudge, CEO of Advancing Opportunities; Rutgers University student and former NJBIA intern Raul Rodriguez; NBIA President & CEO Michele Siekerka, and Frank Halpin, career development specialist. Advancing Opportunities, a nonprofit that connects disabled college students to professional internships at New Jersey businesses, has honored NJBIA with its “Champion of Inclusion” award. 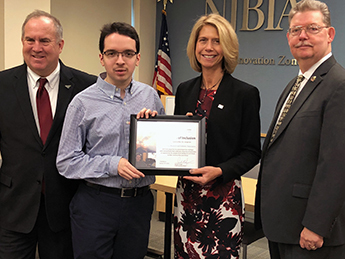 Jack Mudge, CEO of Advancing Opportunities, and Rutgers University student Raul Rodriguez, who recently completed a 12-week internship with NJBIA, presented the award to NJBIA President and CEO Michele Siekerka on Monday. Dozens of Rodriguez’s former NJBIA colleagues also attended to show their support for Raul and the program. Rodriguez, who holds an associate degree in business and is now at Rutgers studying for his bachelor’s degree, is one of more than 30 highly motivated college students whom Advancing Opportunities has placed in skilled internships with New Jersey businesses, Mudge said. The internship program was created to help disabled students build their skills and connections because many were having difficulty finding work in their field of study after graduation, Mudge said. “We want them to have opportunities for career paths, not simply a job,” Mudge said. The internship program not only helps put students on their chosen career paths, it also promotes the larger goal of building more diverse and inclusive workplaces that provide opportunities for people of all abilities, Mudge said. Businesses and organizations, such as NJBIA, that participate in this effort are to be commended, he said. While interning at NJBIA, Rodriguez worked with staff in the finance and membership departments to build databases and financial spreadsheets, and received outstanding performance reviews for his work. He is now studying labor relations at Rutgers and says the NJBIA internship arranged through Advancing Opportunities was a valuable experience. Advancing Opportunities is a leader in the field of disability services and its internship placement program is just one of a wide range of education, assistive technology, residential, and career development programs it provides to support children and adults with all types of disabilities. To learn more, go the nonprofit’s website at www.advopps.org.